Dharlee presents a new fresh minimalist style name necklace. The size is a bit hard to capture with the camera. I make these nearly as small as the lettering on my rings and the chain is very delicate as well. This is a true minimalist style for those who want a tiny and thin jewelry option. The lettering is roughly 2/16 to 3/16 inch tall, slightly more for letters with a "tail". Depending on the length of the name, it could be anywhere from 1/2 inch to 1.5 inches long. Please choose up to 9 letters. 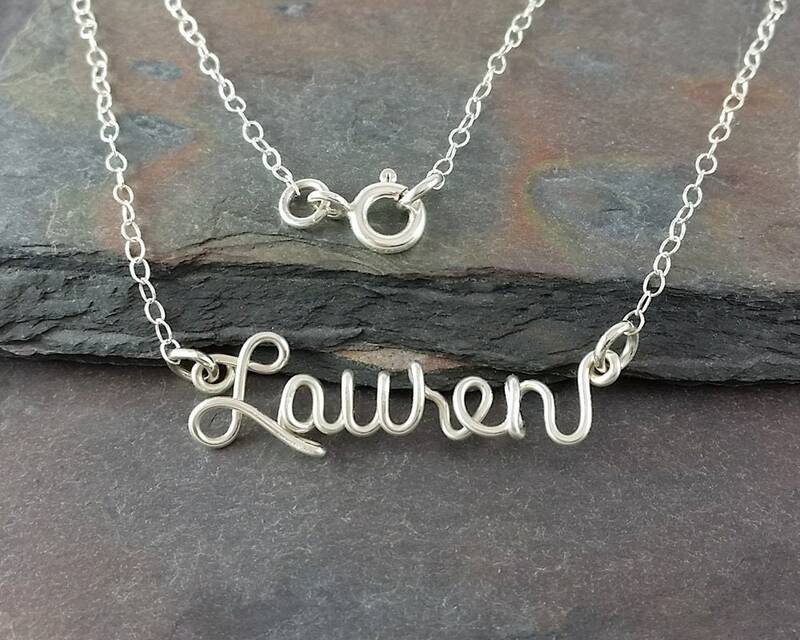 The name is attached to a flat cable chain with a spring ring clasp. You may choose sterling silver or 14k yellow gold filled material. These are the only two choices available for this necklace at this time. As with all my jewelry, this comes gift boxed. The chain just fell out of the clasp after a few weeks. After seeing the review I contacted the buyer to let her know I would be happy to fix the necklace at no cost to her but unfortunately I never heard back. My granddaughter went crazy when she opened her name necklace with the heart- she said it was her favorite birthday present ever! Seller was so easy to work with: communication was great, packaging was lovely and shipping was super fast. Highly recommend this necklace and seller! So quick and perfect! Thanks! !